A pretty freaky and creative movie, that captivates for a while, but it does get a little tiring in it’s final act. 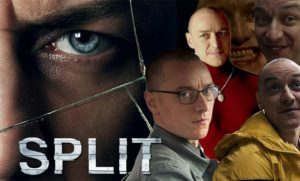 Split is a surprisingly entertaining and thrilling movie. The content makes it look like it will either be a little silly or else just very disturbing. It’s not really either one. What it is, however, is exciting. M Night Shamalan is back in top form with this movie that takes a smart and entertaining look at multiple personality disorder. The movie does lose some steam in its final acts, as it starts going on a little too long, but Shamalan definitely delivers with this one, carefully giving us a little bit more at a time, and saving certain personalities for the exact right moment. Split is an M. Night Shamalan movie, and it’s the best movie this writer / director has made in years. Back in the late nineties / early two thousands, Shamalan was on fire with movie making, knocking it out of the park with his first two films, (The Sixth Sense and Unbreakable,) and turning in a pretty creepy thriller for his third movie, Signs. But after that, audiences grew tired of the gimmicks, and his next two movies were known to be stinkers. Those movies were the Village and The Lady in the Water. It got worse. Shamalan began making movies like The Last Airbender and After Earth, that nobody went to see. If looked like he was done. But as John Travolta and Ben Affleck know, it just takes one good movie to turn everything around. For Shamalan, that one movie was Split. Not that it’s a great film, but this is certainly the most interesting work Shamalan has turned in, for quite some time. It’s a movie about a man with multiple personality disorder who kidnaps three girls and holds them captive. In some ways it reminds me of the movie Kiss The Girls, with Morgan Freeman, where girls were also being kidnapped and held in what looked like a similar underground bunker. The difference here, is the multiple personality angle, and that’s actually what makes this movie so unique. There haven’t been many movies about characters with multiple personality, and if there are, than it’s more like a gimmick or twist at the end. Movies like Identity and The Color of Night feature ideas like this, but they use them for thrills, rather than to actually examine what the disease is all about. Split does that. It tackles the science of multiple personality, and it does that by having the protagonist, Kevin, (James MacAvoy, in his best performance,) pay visits to a psychologist who is working with him, throughout the film. It’s there that we hear stories about the disease, such as one person who was taking notes with both her left and right hand at the same time, and the two sets of notes were about different topics. This might not be scientific or true, but it certainly sounds interesting. But aside from being about the science of the disease, first and foremost this is a thriller. And it’s a thriller that manages to steer clear of Shamalan’s end twist trademark, (the thing that got him into trouble with The Village.) Luckily this director has learned, and he has learned that people want more than just an end twist, and that if the end twist is too great, (like it was in the Village,) than people end up walking away angry and resentful, feeling like they’ve been cheated. And so Shamalan doesn’t go for that here, and the movie is far better off because of it. What we do get is a pretty scary movie about a mentally confused person who kidnaps three girls. The opening scene puts us right in the shoes of the girls and really gets us hooked. It’s a birthday party for one of the girls, where the party is wrapping up and the birthday girl’s father talks to his daughter about one girl who is still there. Casey is the girl with no one to pick her up, and so the birthday girl (Claire’s) father offers to give Casey a ride home. And so the girls, (which include Claire, her friend Marcia, and Casey,) get in the car. The father goes to the trunk to put something away, and that’s when Kevin approaches and attacks. And then we watch the inside of the car, from Casey’s point of view. We literally take on her perspective, seeing only what she sees and notices, as a figure gets into the driver’s seat of the car, beside her. Casey is looking ahead, not seeing the person who entered, but she notices what his hand puts down in front of her. She also notices, but looking out her sideview mirror that the bag Claire father was holding, is now on the ground, its contents spilled about. That’s when Casey looks up and sees who is sitting in the driver’s seat. Talk about an opening. This is a very impressive hook, and it definitely captivates the audience. From there, we see the girls locked in a room inside a bunker, as Casey wakes up. Again, seeing things from her point of view, we spot the two other girls on a bed together huddled up with each other in fear. When Casey sits up, she asks what’s going on, and they tell her that their abductor is right outside of the room. And then he comes in and grabs Marcia, dragging her out of the room. But not before Casey can give her some advice. “Pee on yourself,” she tells Marcia, and it turns out to be some pretty terrific advice. Marcia does it, makes herself undesirable to Kevin, and so he returns her to the room in disgust. And now we start seeing Kevin come back and forth into the room, over the next couple of days, as different people. The first time the girls catch on that he has multiple personality disorder is when they think there is a woman outside of their room that Kevin is speaking with. They can make out the high heels and dress, through a crack in the door that they are looking through. And then the door opens and it’s Kevin, dressed up as a woman, doing the voice and mannerisms of a woman as he speaks to them. The next personality they meet is that of a little boy who just wants to show them things and play. And as they meet each of these personalities, (including an obsessive compulsive one who wants them to keep the bathroom clean and has color coded bottles for them to make it easier,) the girls plan different ways to escape. And each of them tries a different method. Only once a girl tries, she is caught and taken away from the others, locked up in her own room from that point on. All of this is interesting and entertaining. And we keep hearing, throughout the course of the film, about a personality that has not come out yet, known as the beast. This one is apparently superhuman, with skin that can’t be pierced or penetrated. The beast can apparently climb up walls, and is in some ways more animal than man. And you better believe we get to meet him by the end, and the reveal of the character does not disappoint. The movie does start to get a little tiresome in its final acts, before meeting the beast, as shots are held for a little too long, and things like that, but it just barely detracts from an otherwise pretty cool and scary film.